A normal American home would have a trusty basement where the whole family could store everything that they are not currently using but might still need in the future. It has all sort of things like furniture, old curtains and clothing, photo albums, and other memorabilia. This stuff gathers molds and mildew, dust, and other organisms that create that musty smell in the basement. This is why people are now on the lookout for the best dehumidifier for their basement to improve the atmosphere. A contributing factor to the musty smell and growth of harmful organisms in the basement is its location. Understandably, they are under the house where most of the water fixtures are located. They also easily get wet during typhoon or even with light rains. Because of the moisture present in this area in the house, it becomes a breeding ground for fungi, molds, mildew, and bacteria. A basement would normally have a relative humidity (RH) higher than the tolerable range, which is 60% RH. Having an RH above this normal range is harmful to people, especially to children and the elderly who have weak immunity. An unhealthy RH brings sickness to the family such as allergies, asthma, and skin diseases. Although it can be argued that the family does not often go in the basement, the air inside it still affects the overall air and humidity in the home. In addition, anything that is stored in your basement will be affected by the humidity conditions in there. With the use of the best dehumidifier for your basement, the smell can be made manageable, the health of your family will be protected and your possessions will stay in better condition. 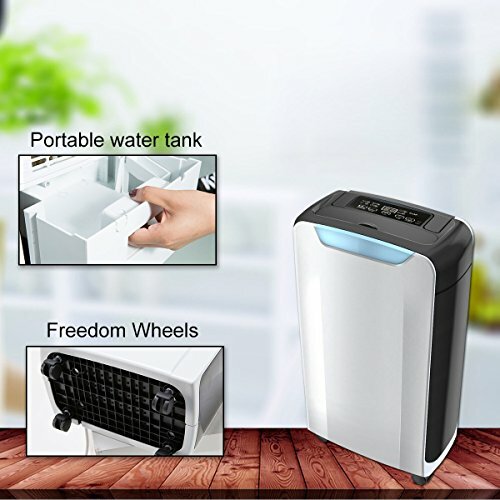 One of the best dehumidifier available on the market is EECOO Portable Compact Home Dehumidifier. It is advertised as something that is perfect for the basement since it has a water capacity of two liters. It can absorb water and moisture of up to 750 ml in a day when the RH in the basement is about 80%, and the temperature is about 86 degrees Fahrenheit. It is also portable, so should the family need to use it in other parts of the house, it can easily be carried or moved as it is lightweight. It also has automatic shut-off once the water tank gets full. The light indicator will turn yellow to signal anyone to empty the tank. 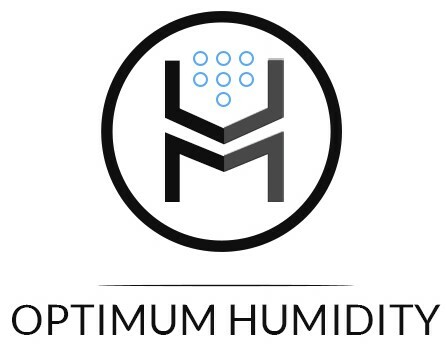 This dehumidifier also uses the Peltier technology, so there is no need for a compressor. It has a 35-decibel noise level, so it does not make any annoying sound in the home. It can also be used in the bedroom or study area because it is relatively quiet. This portable basement dehumidifier can cover small to large areas. It has an LED indicator light that tells users what to do. Green light means it is working properly, while yellow means it is resting, so water needs to be removed from the tank for it to start working again. Another good thing about it is its auto shut-off, which really shuts it off, so the tank will not overflow and cause more damping in the room. It also has large water capacity, so the user would not need to empty it very often. The sound it produces is still not silent enough for other users. It is not as efficient as dehumidifiers with compression system. A number of users think that it is only good to be used in small rooms and basements. 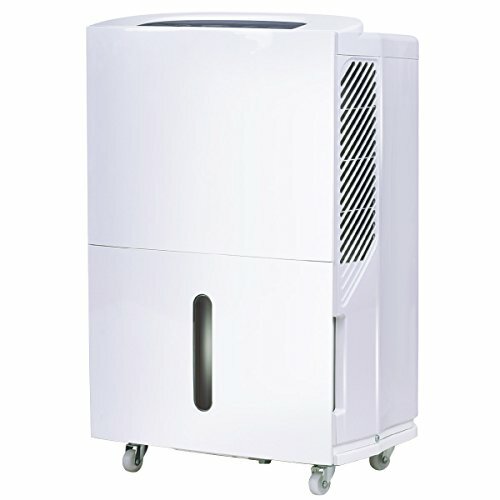 The second on the list is Costway Portable Energy Star Dehumidifier. The best thing about this one is the electronic controls that include a digital display. 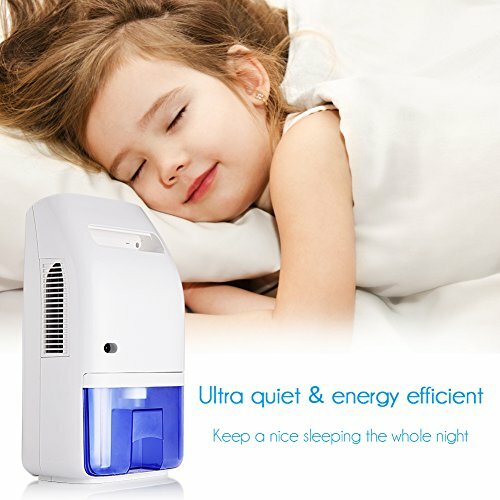 It has three fan speed options, and it also has a 12-hour timer if users do not intend to run it 24/7.It also comes with a filter that can be easily cleaned as needed. This dehumidifier has a tank capacity of eight liters. It is bigger than most of the models that are available on the market. Since it is heavier, it has caster wheels at the bottom for it to be easily moved from one room to another. It has two options for emptying the tank. First, the user can remove the front bucket to empty it easily. The bucket has an ergonomically designed handle to make it easy to remove, carry, and put back. The other option is to use the drain connected where an 11.5 mm hose can be connected for direct draining to the sink, for instance. It is also easy to use as the options are explicitly stated on the display and controls area. It also has LED indicator lights to tell when it’s time to empty the tank when the user is not directly draining it. This dehumidifier is bigger and better than the others. It is easy to operate, and its performance can be controlled depending on the situation. It has options for fan speed and a timer to match the needs of the home and preference of the users. It also has washable filters to make sure that all possible allergens are removed from the air. The caster wheels and handle make it very easy for everyone to move it room to room, and to empty the water tank as needed. It is perfect for small to big rooms, especially the basement. The water tank can accommodate eight liters of water. Emptying the tank will not feel like a chore. It is bulkier than the others. The fan could be noisy depending on the speed level. The last one is Eurgreen Compact Portable Dehumidifier. This one uses compressor technology and can remove up to 20 pints of moisture in the air per day if the RH is 80% or above, and the temperature is about 86 degrees Fahrenheit. It has 1.5 liters tank capacity. It has a noise of only 50 decibels and has an auto shut-off feature as well. It is very light and easy to move from one place to another. It can be used in up to 200 square feet areas. It also has an indicator light to tell when it’s time to remove the water from the tank. There is also an option to drain the water directly from the tank. This works almost the same as the more popular dehumidifiers on the market, though with smaller water tank capacity. It is quieter than compression-type dehumidifiers. It has all the basic features such as indicator light and Peltier technology. It is smaller than the other models. It does not make much difference in the humidity of medium to big rooms. 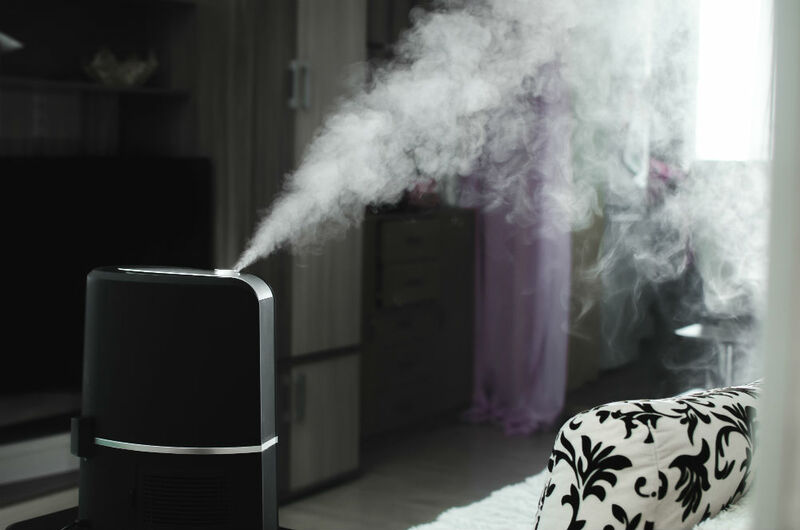 This short 5 minute video gives some additional tips on how to use the best humidifier for your basement to reduce humidity levels. Where very high humidity levels are a problem, it is suggested to monitor external humidity levels and find the lowest levels each week so that you can plan the best time to open your basement window. This will provide much needed ventilation and help your dehumidifier get the humidity levels down. The best dehumidifier for the basement is Costway Portable Energy Star Dehumidifier. Basements are usually big spaces and contain a lot of moisture in the air. This one is big enough to cover all the bases, and portable enough because of its caster wheels and handle to be brought from room to room. With Costway Portable Energy Star Dehumidifier, the family can breathe healthier air and can say goodbye to the musty odor in their basement.